Jeroen Sormani	is ready to help you get the answers you need. Jeroen Sormani	will reply to your questions about Get extension name	shortly. We appreciate your feedback about your support experience with Jeroen Sormani, developers of Custom Thank You Pages. This helps us maintain high standards on the WooMarketplace, and helps Jeroen Sormani improve. Glad to hear it went well with Jeroen Sormani. Tell us more. Did Jeroen Sormani get back to you? Do you have any additional feeback for us or Jeroen Sormani? With the Custom Thank You Pages extension you can do exactly what it says; configure custom thank you pages, per product. The thank you page is a very powerful place that can be optimized, which not many eCommerce sites do. Why is it such a powerful place? Customers have just purchased something, giving you their hard earned money and more importantly, their trust. Assuming you sell something amazing, the customer will have a good feeling about their purchase and probably a boost of endorphin (having a feeling of euphoria). As you can imagine this is the best time to use that feeling and interest for good. When knowing exactly what a customer purchased a more personal experience can be created to upsell the customer to purchase again with your business. The Thank You page is one of the pages that customers actually pay greater attention to, meaning for any store owner this is a great opportunity. Showing related products based on what someone just purchased is incredibly powerful. The customer may not order it right away, but they will remember your store next time they need it. 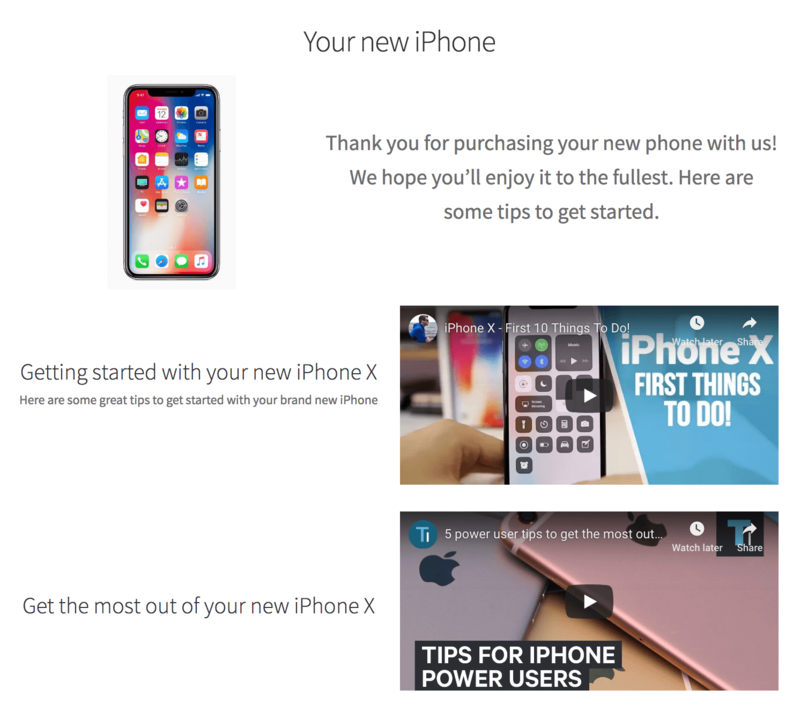 With a custom thank you page based on the purchase of the customer you’ll be able to create a seamless onboarding experience for the product they just purchased. Whether this is a downloadable product that they can download and start right away or a physical product that you want to give more details about, its all possible. After purchasing a digital product, showing how to download it is the most important thing. Right now this is shuffled away as something small and insignificant, but with relevant information this experience can be greatly improved. Of course you can also consider doing it during the checkout, but you and I both know that the checkout should be as short and simple as possible. Adding a newsletter subscription box can only distract customers from their purchase. When someone purchased something at your site you know 100% sure they’re interested in what you have to offer. A great opportunity to also ask them to subscribe to your newsletter. No more pesky pop-ups with newsletter signups – please. A few sample scenario for eCommerce sites of different categories of products. How are custom thank you pages configured? Custom thank you pages are configurable per product in the ‘Advanced’ settings tab and even per variation. When no custom thank you page is configured it will fall back to the existing/default thank you page. What happens when multiple products with different pages are configured? A priority system is build in to determine which page(s) should be showing. There’s also a setting that allows you to have multiple navigation pages in one – a navigation will be added to navigate between the different pages. Can I still show order details on custom thank you pages? Of course! A series of shortcodes are available in the documentation to display any of the order details on your custom pages.